To see the original post, click here. Thanks to Chelsea for her review! 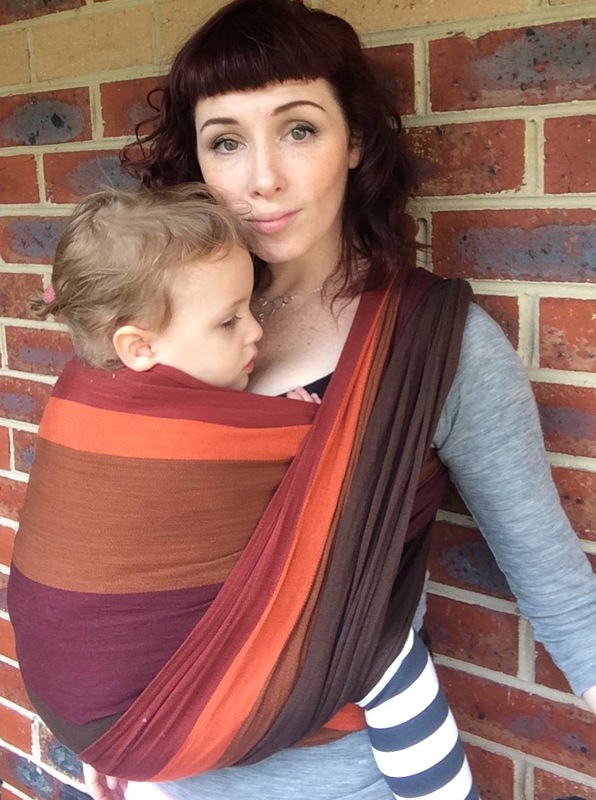 Babylonia wraps are pure organic cotton, non-toxic dyes and fair trade labour (India). Sound good? Nova Naturals sent me a Passionfruit to take out for a spin and venture an opinion on, and after an initial "this is cardboard!" I got a lovely surprise when I pulled it off the clothesline. Cross-twill is a weave that fluffs up nicely with a bit of wash and wear. It has a little bit of cush while being essentially flat and without the texture of a jacquard pattern. The diagonal give is quite uniform and easy to work with for new wrappers (I had some willing test subjects at a meet!). These are a really nice, simple budget-friendly option ($69USD for a shortie, $119USD for a size 6, $129USD for a size 8) that break in in the blink of an eye. I washed this twice, sat on it a bit, and had a perfectly moldable wrap that is soft enough for a new baby and generous enough in width (78 cms) to wrap my 3yo. How did it stand up to 15kgs/34lbs? Really well. 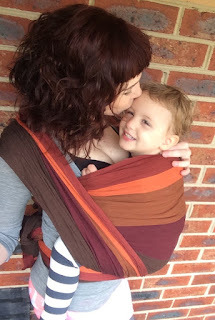 I would not love it in a single layer carry, but with a couple passes supporting Audrey, this is a fantastic workhorse of a wrap. The weave is flat enough that it won't snag or pull easily, with just enough bounce to be easy on the shoulders - the perfect summer wrap, and this would be a perfect rebozo/torso carry shortie. BBslens have a wide range of simple striped wraps and have just brought in a bunch of jacquard designs if you fancy something a bit...fancy! Verdict? Great budget wrap. Great starter, great lender, great cuddle blanket for the toddler, excellent beater and all-rounder. Easy on the eye and easy on the pocket. Thanks to Chelsea of Keep Calm and Carry Them for the great tutorial! Check out her website Keep Calm and Carry Them for other great tutorials and reviews. Introducing the Tricot Slen Cool! Made from Newlife, a unique, high-tech fiber made from recycled plastic bottles, the Tricot Slen Cool is extremely light, has equal carrying capacity to a woven wrap and is as flexible as an elastic wrap. With the same special knitting technique as our original Tricot-Slen Organic, the Tricot-Slen Cool offers perfect support for all babies, from newborns up to toddlers of 40 lbs. This hybrid wrap can be worn in many different positions and since the same tie is used for all carrying positions, it is easy and quick to put on. Its natural stretch guarantees a perfect fit and makes this lightweight wrap comfortable and easy to use. This moisture wicking fabric is machine washable and air dries quickly. Delightfully cool in the hot summer months, this wrap is still cozy in winter's chill. Thanks to its remarkable stretch-stop qualities the Tricot-Slen Cool also offers long lasting support, and in contrast to baby wraps made out of Spandex or Lycra, it does not cause your baby to bounce up and down.